CHINA is growing increasingly frustrated with North Korea after its series of missile tests and nuclear explosions. 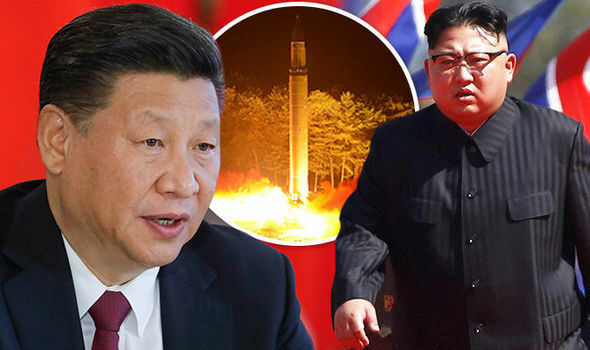 Kim Jong-un’s regime, which used to notify Beijing ahead of weapon tests, did not issue a warning before its nuclear blast earlier this month. North Korea expert Zhao Tong said many Chinese people “now see North Korea as a major liability”. Defiant North Korea has fired 22 missiles during 15 tests since February, despite international calls for the country to stop its weapon operations. A hydrogen bomb was detonated on September 3 in the regime’s most powerful nuclear test to date. And the rouge state’s weapon tests have put a strain on China and North Korea - two historical allies. Chinese Foreign Ministry spokesperson Hua Chunying said on Friday: "China is not the focus. "China is not the driving force behind the escalating situation. And China is not the key to resolving the issue." She said Beijing has made “enormous sacrifices” in an effort force Pyongyang to end its weapons programme. Last week, the United Nations Security Council voted unanimously to step up sanctions against North Korea by imposing a ban on textile imports and fuel supplies being capped to 30 per cent. Washington has lobbied hard for a total embargo on fuel, though China and Russia have both refused. Now, however, Beijing could agree to such a ban, according to experts like Cheng Xiaohe, deputy director of Renmin University's Centre for China's International Strategic Studies. Yesterday, Beijing’s ambassador to the US warned that China will never accept North Korea as a nuclear weapon state. Cui Tiankai also called on US President Donald Trump’s administration to stop threatening the state, and instead “resume dialogue and negotiation” over the stand-off. He said: “Honestly, I think the United States should be doing much more than now, so that there’s real effective international cooperation on this issue. North Korea launched a missile, believed to be an intermediate-range ballistic missile, over Japan on Friday. Mr Trump condemned the launch and said the state had "once again shown its utter contempt for its neighbours and for the entire world community”.